Wait a little bit and see what kind of allocations are made. Supposedly they will build plenty of them in South Carolina. If there’s plenty of cars, there can be plenty of hacking. And A-Plan won’t be offered on that car for many months, I suspect. I think the car will arrive late October to November. Volvo subscription payments are only mildly attractive if you want a 2 year/15,000 mile lease on a specific configuration with only color choices. Volvo pushes that program, not the dealers. Disclaimer(s)The Loyalty Bonus is available on select Volvo models and can vary whether vehicle is leased or purchased. Customer eligibility requirements must be met for the Loyalty Bonus offer. Residency restrictions apply. Please see dealer for details. Individuals who currently own/lease any model year Volvo or Saab vehicle OR have owned/leased within the last 6 months are eligible. Offer open only to legal U.S. residents who have a valid U.S. driver’s license. Offer is not transferable and cannot be combined with Conquest offer. Vehicles purchased outside of the program dates will not be eligible for this offer. Offer cannot be used towards the payment of sales tax. This offer is subject to federal, state and local taxes. Offer cannot be applied to lease or purchase of any other model year Volvo or vehicles purchased as used and/or Overseas Delivery (VCIC) program sales. No security deposit required. Monthly payment of $369, based on $36,795 MSRP of 2018 S60 T5 Momentum FWD, includes destination charge. Lessee is responsible for excess wear and mileage over 10,000 miles/year at $.25 / mile. No security deposit required. Monthly payment of $429, based on $41,295 MSRP of 2018 S60 T6 Momentum AWD, includes destination charge. Lessee is responsible for excess wear and mileage over 10,000 miles/year at $.25 / mile. No security deposit required. Monthly payment of $449, based on $43,895 MSRP of 2018 S60 T5 Inscription FWD, includes destination charge. Lessee is responsible for excess wear and mileage over 10,000 miles/year at $.25 / mile. No security deposit required. Monthly payment of $515, based on $47,395 MSRP of 2018 S60 T6 R-Design AWD, includes destination charge. Lessee is responsible for excess wear and mileage over 10,000 miles/year at $.25 / mile. No security deposit required. Monthly payment of $525, based on $48,395 MSRP of 2018 S60 T6 Inscription AWD, includes destination charge. Lessee is responsible for excess wear and mileage over 10,000 miles/year at $.25 / mile. Any deals on the S60 Cross country? Looking for around 200 a month! You are the crystal ball guy, shouldn’t you know the estimate date of $200 S60s? Anyone wants to stare at S60 during the game tonight? Play The Longest Drive during this Sunday’s game and you could win a 2-year subscription to the all-new S60 from Care by Volvo, the new way to get a car. About half of the S60s built there will head overseas. Why do you think it’s bad news for hackers? It sounds like the expectation for the US market is 2,000 cars per month, that’s going to be tough without heavy promotions, IMO. Thoughts? Because I’d rather Volvo overestimated the US demand and the inventory would grow, causing them to incentivize more. 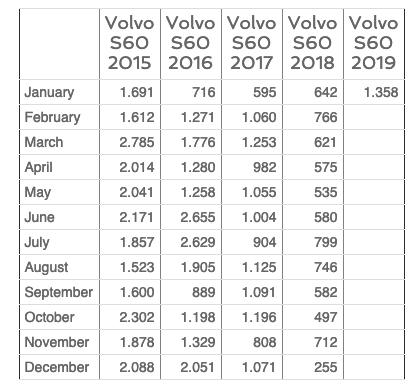 I’m not even sure that Volvo planned to start moving 50% to Europe that soon. Yeah they haven’t been selling >2000 units a month for a couple of years but in fairness most people who want one have probably been waiting for the newer model. I just think sedanpocalypse should still keep the possibility of some decent deals alive. What we do we reckon the sweet spot will be… $350ish for a basic T5 MOM? Still strong number, I think, considering no incentives in January. But yeah, it is a sedan. There is also already $750 in the a-plan. I was told by a dealer in NE that ordering one may take a few months - rail system is not in place at the factory and cars are being trucked to the rail and then trucked off the rail to the port.